subject to approval being given by the local Commune de Fromelles, fund and inaugurate, somewhere within the vicinity of the old battlefield at Rouges Bancs, Fromelles, a memorial to the men of the British Army, and others, who fought there, during the period of the Great War. The following information in italics is taken straight from the WFA website. During the four years of the Great War, British division after division fought in that area of the Western Front which we now know as Fromelles and which forms part of what is now referred to as “The Forgotten Front”. Prior to the discovery of the mass graves at Pheasant Wood, Fromelles was known only for being the place where the Australian Imperial Force had experienced its first, and disastrous, taste of action on the Western Front. Whilst Fromelles hosts both the CWGC memorial to the AIF at VC Corner and the Australian Memorial Park, with the exception of a small private memorial to an officer of the Rifle Brigade, no memorial to the British casualties exists in this area. British losses were numbered in their many thousands in and along this line, but the majority of the men killed in action in this area between 1914 and 1918 are commemorated on the Ploegsteert Memorial to the Missing in Belgium. Having attended the inaugural ceremony on 9 May at Fromelles two years ago (and the one last year – see 9 May 2010 ceremony), I am all too aware of not only the knowledge of Victoria Burbidge and her colleagues but their passion for ensuring that British endeavours in the Aubers Ridge area are not completely overshadowed by the deeds of their Australian comrades in July 1916. Losses for the 9 May 1915 Aubers Ridge attack were just as catastrophic as any incurred over a year later on the First Day of the Battle of the Somme, 1 July 1916. Sadly, their losses have been overshadowed in recent years. 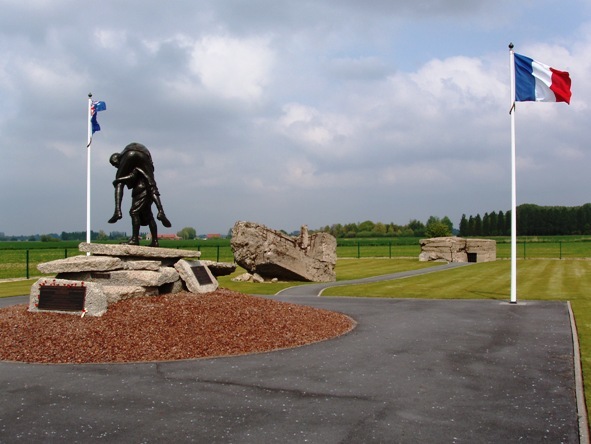 By educating people about the magnificent efforts of the British Army in this area of the ‘Forgotten Front’, the Association will endeavour to redress this balance and should be the first port of call for anyone, regardless of nationality, who is interested in Aubers Ridge and Fromelles throughout the Great War. Well done once again to all those involved in this excellent idea.